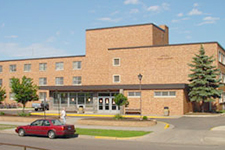 Constructed between 1957 and 1959 Mitchell Hall was named for W.B. Mitchell, former resident director. The residence hall houses more than 450 students and is adjacent to Garvey Commons. From 5th Avenue turn east on 6th Street S. Follow 6th Street four blocks to 1st Avenue. Turn left on 1st Avenue, proceed 1 block; Mitchell Hall is on the right. The nearest public parking is the pay lot at 4th Avenue/5th Street. Street parking may also be available.